DOGLOVE - for the love of dogs (and cats too! ): Not again! Sigh, when it rains, it pours! 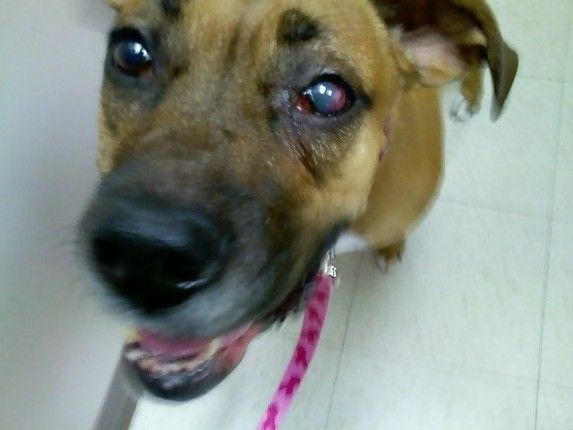 Poor Delta had a vet visit tonight which confirmed that she has another corneal-ulcer (in her right eye this time; the one from January-March 2009 was in her left eye). Hopefully it has been caught early enough that the RIGHT treatment will work quickly for her and not drag on like it did the first time around. Sadly, this seems to indicate Delta may be prone to getting them. My sweet girl is so patient with me with all that I do to her, so at least treating will not be as stressful as it could be. sAwww, poor Delta! Huge hopes that this ulcer was caught in time! Xena had surgery on her right eye a few months ago, to repair a prolapsed third eyelid. Now, she suffers dry-eye & two forms of drops are administered twice a day in both eyes. Awww so sorry! My lab mix Rinaldo had an ulcer a few months ago - no fun! Of course he didn't want anyone near his eyes ... which made it harder. And then he ended up getting entropion from the whole incident and needed ANOTHER surgery.